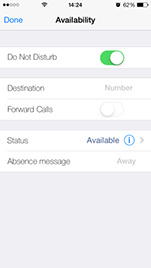 Do Not Disturb: To block incoming calls, turn on the Do Not Disturb option. Slide your finger across the toggle button to turn it ON or OFF. Forward Calls: Slide your finger across the toggle button to turn it ON or OFF. If this is the first time you use this option you will have to provide Destination phone number to whom you would like to forward your calls. Status: This allows you to change your current availability to Available, Busy or Away. Absence message: This option allows you to provide more information to your colleagues at work when you are unavailable.